The peace and tranquillity of Stover Golf Club, located on the edge of Newton Abbot, is a convenient treat for golfers in the South West with easy access from the A38 and M5. It is very accessible to members and visitors alike. 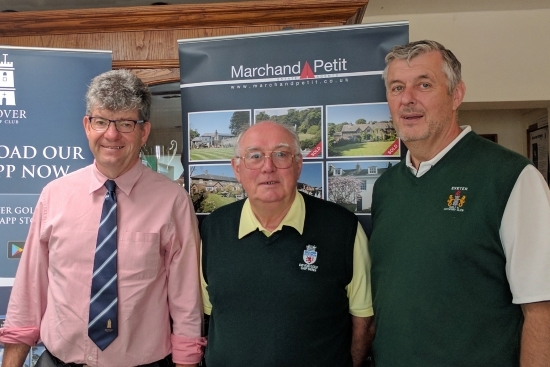 The course is one of the best parkland courses in the region and General Manager, Colin Nolan, did a great job of hosting the annual Charity Golf Day for Saltram Rotary Club, who have been running the annual events for 15 years. Sixty-three golfers, in 21 teams of three, were delighted when the course was re-opened after puddles on the green threatened to halt games on the day. Stover Golf Club was founded in 1931, although its origins can be traced back to 1894 when Major Harold St Maur created a course on his own estate, which was interwoven with the Stover pheasant shoot. The 18 hole course features a wide variety of holes, elevation change, mature trees, streams and scenic ponds. The course design was influenced by "5 times British Open Champion - James Braid" and provides easy walking, narrow tree lined fairways but contains subtly contoured greens that present a fair but challenging test of golf for all enthusiasts. The 18 hole 5959 yards course off the back tees consisting of two loops of nine holes, which both come back to the club house. Robert Jones, from Saltram Rotary Club concluded: “it is expected that the event will have raised close to £2000 for the two chosen charities”. Competitors were already looking forward to 2018’s event.